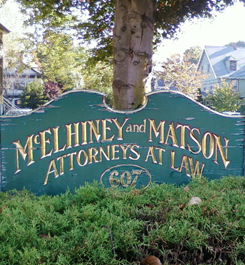 McElhiney and Matson, Attorneys at Law is a law firm in Woburn, Massachusetts, that focuses on loan closings, corporate relocation, and probate. Because we have experience in all facets of real estate law, a real estate attorney from our firm can represent you regardless if you are the buyer or seller. Our team also works with lenders, builders, and relocation companies during real estate transactions. John D. McElhiney and Robert F. Matson, our founding partners, started as two friends attending Suffolk law school in the late 1970s. John D. McElhiney passed away in 2011. Today, we have been in business for more than 30 years, and although we moved our practice in 2013, we still provide the same quality legal counsel that our firm was built on. In addition to practicing real estate law, we also concentrate on probate and family law. Whether you want to draft a will or trust to protect your family or you're trying to devise a parenting plan or visitation schedule with your ex-spouse, we can help. Our firm has also resolved cases dealing with paternity, child support, and alimony. When you work with McElhiney and Matson, Attorneys at Law, your family's future is in good hands. McElhiney and Matson, Attorneys at Law is a law firm that focuses on real estate law, probate, and family law. Whether you want to protect your assets during a real estate transaction or you have found yourself in the midst of a land dispute during probate, you can rely on us to ensure your best interests remain a priority throughout the proceedings. Whether you need an experienced probate attorney or an aggressive divorce lawyer, we can provide the legal counsel you're hoping to find. Our attorneys have decades of experience practicing law, and we will give your case the care and attention it deserves. "Attorney LaMothe assisted in the refinance of our home. We did not have to worry about any of the details." "I hired McElhiney and Matson to sell my condo. The transaction was seamless on their end. My numerous calls and emails were always answered in a timely manner."